And we too let us fast with purity and righteousness and let us also pray proclaiming and saying. I have sinned, I have sinned, My Lord Jesus forgive me, for there is no servant without sin nor a master without forgiveness. Our Father who art in Heaven, hallowed by Thy name, Thy kingdom come, for Thine is the glory forever. 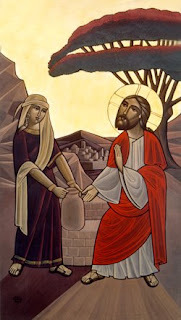 - Great Lent Hymns for Cantor Gad Lewis, Higher Institute of Coptic Studies, and Ibrahim Ayad.